Want beneficial information on dental veneers aftercare? Veneers are a common option for those looking to improve the aesthetics of their smile, mainly because they look so natural. When someone is looking to improve their smile, they often want a natural-looking smile. Veneers are therefore ideal when it comes to improving the aesthetics of a smile and should always be further explored by those looking for a smile makeover. Ready to learn tips so you know how to care for your veneers after they have been placed on your teeth? Dental veneers not only look natural, which makes for a really great smile, they are also versatile. They are often used to cover up tooth imperfections like chips and small breaks, making it so it is difficult to tell that the tooth has ever been damaged. They can solve the problem of uneven teeth, as veneers can be used to alter the shape and size of a tooth. They can also be used to close any gaps existing in between the teeth. 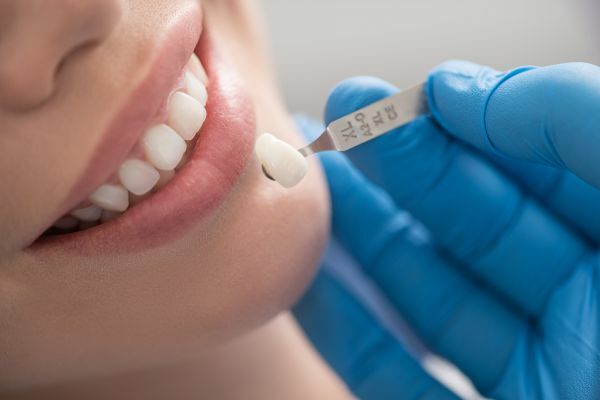 The following is a list of important aftercare tips for those who have chosen to get dental veneers, so they can always have a smile they can be proud to show off! While practicing good oral hygiene should already be done on a daily basis, it is especially important after having dental veneers. Good oral hygiene consists of gently brushing the teeth twice a day using a soft-bristled toothbrush and a quality toothpaste, as well as flossing at least once a day. It is essential to avoid chewing anything hard, as this can cause the veneers to break. Wearing a mouth guard when playing sports or participating in any type of activity that can potentially cause someone to fall down or get hit in the mouth is highly suggested. A hit in or around the mouth area can cause the veneers to chip or break. If you have any questions related to dental veneers aftercare, all you need to do is call us right now, and we will provide you with the answers you need. When you are considering getting dental veneers so you can feel more confident about the way you look when you smile, it is necessary for you to understand how to take care of them after having them placed on your teeth. If you have already decided to have dental veneers placed on one or more of your teeth, we look forward to you contacting us so we can get you scheduled in at a time that works for you.